Are you planning on taking your child fishing for the first time? 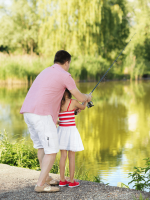 Fishing is a wonderful outdoor activity to introduce to children early in life. Not only is catching a fish fun, but simply spending time together learning a new sport is a great way to bond with your kids. My husband, Chase, grew up fishing with his family at local ponds, rivers, and lakes, and more recently has done some in-shore coastal fishing. It’s one of his favorite hobbies and one that he has already enjoyed sharing with our three year old. Below you will find some of Chase’s top tips for fishing with kids. Hype it up. Talk about fishing in advance and share fishing stories that you might have. Let them know how much fun it can be. Select a location. Stock ponds are a perfect place to start because the fishing pressure is low, and the fish are usually hungry! If you don’t have access to any, then just find a local park at a lake with a pier or mowed area on the bank. Start small. A kid fishing for the first time doesn’t care about size; they just want to catch a fish, so targeting bluegill or sunfish is a great place to start. They are plentiful in almost all regions of the country, and if you’re lucky, you may even hang a bass or catfish. Make it comfortable. I was able to find a spot to back my truck up to the water’s edge and fish off my tailgate, but you can also use a cooler to sit on or chairs. The benefit of the cooler is that you can bring drinks. Find a place in the shade if possible, and try to keep your child out of the tall grass if there isn’t a pier to fish off of. Jeans and running shoes can also help to prevent bug bites. Choose the bait. I prefer live worms for the first time. They are universally desired by most fish, easy to put on the hook, and kids love to play with them. (Well… most kids!) You can pick them up at any bait shop, Walmart, and many pet stores. Choose the pole. The most basic, user-friendly rod and reel combo is a spincast. When we take the kids fishing, we use the Zebco 33 Spincast Combo or a small Shakespeare kids combo like this one. I learned on a Zebco, and it’s a great option due to price and ease of use. Rig the pole. I keep it simple – hook, weight, bobber. Kids love seeing the bobber go under, and it gives them a definite signal that something is biting the bait. I prefer 6-10 lb test fishing line rigged with a #8 or #10 hook with a Size #3 or BB split shot weight about a foot above it and a bobber two or three feet above that. If you need help tying the hook on the line, check out this link and follow the steps for the palomar knot. It’s the easiest and strongest knot. Then, simply run the worm through the hook a couple of times, and you’re ready to fish. Give them a task. It helps to keep their attention when you give your kid a task. I always ask my daughter to be in charge of giving me new worms. Fish on! You can’t catch a fish if your line isn’t wet, so it’s time to get started. Cast out to a distance reasonable for your kid to reel in a fish from. If you don’t get a bite in two or three minutes, have them reel it in, check the bait, and put it somewhere else. This will help keep them engaged and help you locate the fish. Have fun!! This is the time to be relaxed with rules. 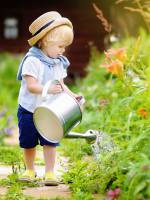 Try to keep them engaged, but don’t be afraid to let them play with the worms, poke around in the mud with sticks, or throw a couple rocks in the water. 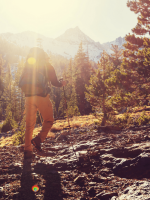 The purpose of this is to get them outside, out of their comfort zone, and have them experience the magic of the great outdoors. The more they enjoy it, the more likely they will want to do it again. 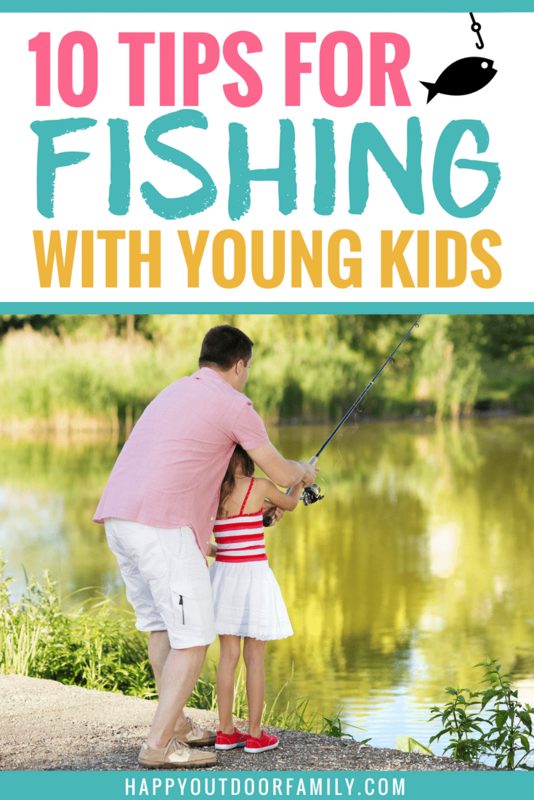 Once your kid catches the fish, help her reel it in and get it up on the bank or dock. Now it’s time for major praise and lots of pics! Once you’re done taking pictures, you can use your hand if you’re comfortable handling a fish or needle nose or fishing pliers to remove the hook and return your catch safely back to the water. What are your favorite tips for taking young kids fishing? 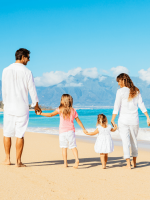 Is your family ready for a challenge? Sign up today for the Get Outside Family Challenge! It’s totally free to join, and you’ll receive free printables and tips for incorporating fun outdoor activities into your family’s routine! Learn more here. Wife to Chase. Mama to three. Blogger. Copyright ©2019, Happy Outdoor Family. All Rights Reserved. Happy Outdoor Family is a participant in the Amazon Services LLC Associates Program, an affiliate advertising program designed to provide a means for sites to earn advertising fees by advertising and linking to Amazon.com.